Most Saturday mornings I wake up to the words “cook the man some eggs”. At first I started taking this as offensive and would reply with “f-off, make your own eggs!” until I learnt it was from the movie Once Were Warriors. I also learnt that many guys are obsessed with this movie. Me, haven’t seen it. I mentioned in my Mushroom Bruschetta post that I cook an egg dish almost every Saturday morning. 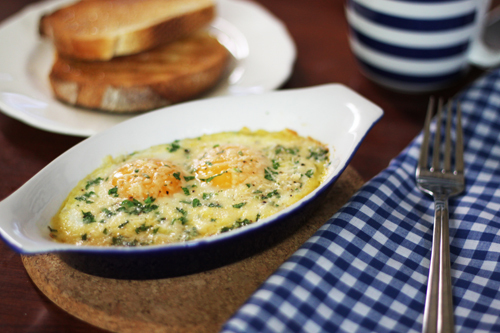 A week or so ago, I cooked baked eggs. I had seen Ina Garten make some on tv a few months back, so I jotted down the concept on a post-it note, put it on the fridge, and there is stuck. It was more of a “what’s in the fridge” kind of dish, because I didn’t actually go back to her recipe to follow any ingredients or instructions. When I woke up that particular Saturday morning, I found eggs, cream and parsley in the fridge and thought “hmm, this could be a good time to make it” (inside of how my brain works, thanks for staying tuned!). So here it is. 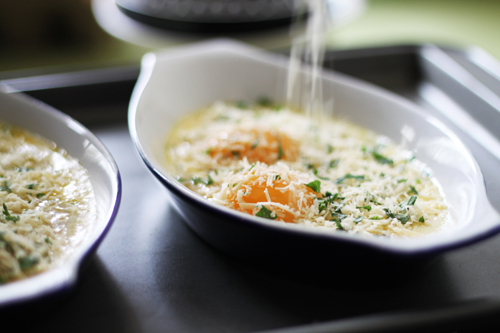 If you love cream and butter and eggs and parmesan and tasty goodness then you’ll love this! If you like a subtle taste of richness then I recommend halving the butter and cream. Oh and hold back on the salt. The parmesan provides the salt element, so add salt later if you like. I also learnt from this dish that you need to use a really shallow baking dish. We put three eggs in one and the whites took longer to cook, which meant half the yolk was cooked. Place a knob of butter and a teaspoon the cream into each ramekin. Place in the hot oven on a tray until the butter melts and the mixture starts to bubble. Remove from the oven and carefully place two cracked eggs in each dish. Sprinkle with the parmesan, herbs and pepper, and place back into the oven for around 5 – 10 minutes, or until the whites of the eggs are cooked and the yolk are still runny. 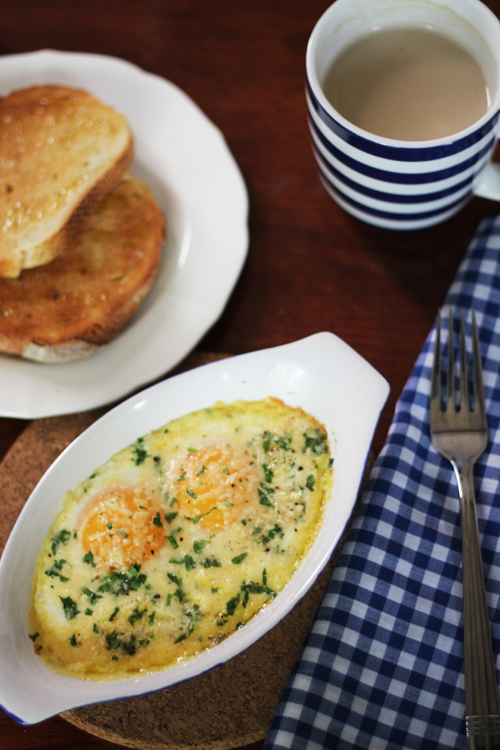 It is best to use the shallowest ramekin dish you have, this way the whites cook quickly, leaving the yolks runny. A deeper dish will slow the cooking process. My mum keeps chooks so we're forever getting cartons of eggs that I don't know what to do with. Another recipe saved to the 'must try' file. Hi! I have just stumbled upon your lovely food blog via acozykitchen. I love your blog! Where are you from? I am a Queenslander living in New Zealand. I just wanted to comment about the obsession with Once Were Warriors because my boyfriend says this alllll the time. Hahah. I'm a Perth girl, born here, still living here. I must say that NZ is on my 'must visit' list! !